Advanced by the Lightning Labs—which by the way has the backing of Jack Dorsey of Twitter and other big wigs, the off chain, layer two solution continue to swell even as prices face insurmountable sell pressure. There is an issue of trust because of state channels and the idea of locking up funds. Nonetheless, all that is faded by instantaneous payments made possible by lack of confirmation times and fund transfer facilitation is via blockchain smart contracts. #Bitcoin is like the internet, but we're still in 1988. On top of that the LN address scalability because we are talking about billions of transactions being processed per second. It literally blows away legacy system limited by 10-minute block time generation and things like those. Furthermore, users need not to complain about costs as the LN create a new, fast and cheap payment rails enabling micro payments. 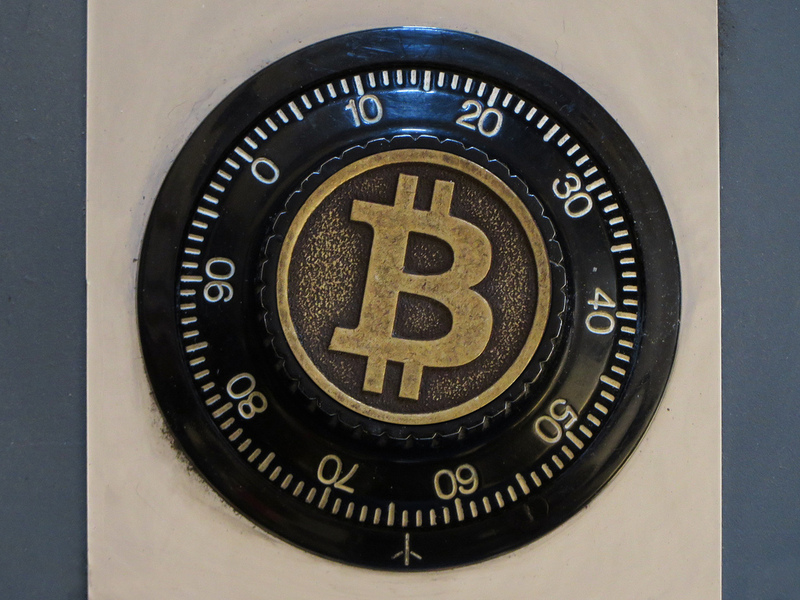 Such are the benefits of the LN and even as some users complain of “nostro–vostro like operation” thanks to 635 BTC or around $2.1 million locked up in the off-chain network, merchants as well as individuals are supporting the network by opening up channels and substituting fiat with censorship resistant BTC. With each red bar, sellers are building momentum and look likely to confirm yesterday’s losses closing below last week’s low. As it is, that will be negative. Although we are bullish on BTC thanks partly to price surges of mid-Dec through early January, any drop below last week’s low could cause a sell spiral and BTC prices could retest $3,200 by mid-February. On the flip side, the only time bulls will be in charge is when there are strong, high volume rally above $3,800. Before then, we shall take a wait-and-see approach and observe whether there will be confirmation of last week’s bears. Overly, sellers are in charge if we analyze price action from a top down approach. Note that bulls are yet to muster enough momentum that could retest $6,000. The level is an important resistance and first target for bulls as it is a bear breakout level. In the short-to medium term, bulls appear to be in charge. However, before we recommend longs, it all depends on how prices will react at this level. 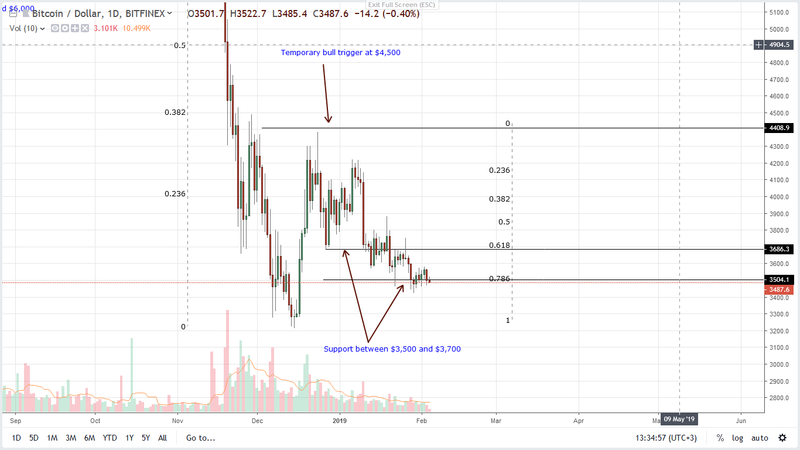 Prices are down to the 78.6 percent Fibonacci retracement level and even if prices recover, our modest target will be at $4,500 with buy triggers at the $3,800 mark. If not and there is further drawn down below Dec 2018 lows of $3,220, then the trend continuation phase would be in progress and BTC stand to shrink back to $1,500 level—an important support level. In the last three weeks or so, two bear bars are conspicuous: Jan 20—20k versus 17k averages and Jan 28—17k versus 12k average. Both are bearish but with high volumes. In a bullish trend, we consider these bars as corrections but for bulls to be in control, any surge above $3,600 and $3,800 should be accompanied by high transaction volumes exceeding 20k or 35k of Jan 10.